The episode writing credit is shared between Brannon Braga and Ronald D. Moore, but Michael Piller had some say in the story. “The first draft of ‘All Good Things’ was very similar for an hour, but the second hour wandered around without a clear story direction,” Piller recalled. “I wanted Ron [D. Moore] and Brannon [Braga] to get more ambitious and suggested the idea of Picard working with different versions of himself in the different time periods to solve the crisis.”  The revised script was submitted on March 10th 1994. Filming took 17 days, starting on March 11th and ending April 5th. The wrap day was April 6th. There were early versions of the story that included the Borg attack at Wolf 359 as a fourth arc. This was the only Star Trek spinoff finale not to be directed by Allan Kroeker. He directed the DS9 finale “What You Leave Behind:”, the Voyager finale “Endgame” and the Enterprise finale “There Are The Voyages”. 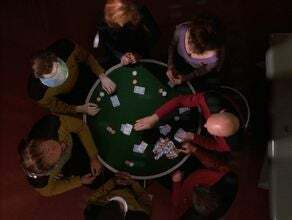 It was directed by Winrich Kolbe who directed 16 episode of TNG, including Darmok, an episode we looked at a few days ago. Patrick Stewart and Jonathan Frankes are the only actors to appear in every epsisode of the series. This episode is the first episode to feature Romulan Cmdr. Tomalak since Season Four. It was the only time Andreas Katsulas appeared on Star Trek while working on Babylon 5. This was a rare time when an actor who was on B5 and one who was on DS9 appeared in the same ep while both shows were running. Speaking of Colm Meaney, he shared his thoughts for Star Trek Monthly “It was strange, very nostalgic. I thought it was a very powerful way for ST:TNG to go out. I thought it was a great story and a terrific episode. It covered a lot of ground and left you thinking”. Rick Berman thought it was “the best season-ender we ever did.” I don’t think I can argue with that. I hope you have all enjoyed Star Trek The Next Generation week, and I encourage you to check out the linked Memory Alpha articles for more details on the making of these wonderful TV episodes. I will close out with some behind the scenes pictures of the making of “All Good Things”, courtesy of Memory Alpha. Have a great weekend, and I will see you on the next Fact Of The Day. Ok for a split second there, that dude behind Riker looked like an older Wesley Crusher, like in the episode where Q made Wes an adult.